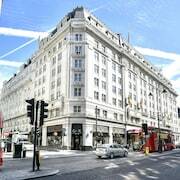 The Hotel is in the perfect location in London! Staff were amazing as well. We will come back to this hotel! Excellent location! The hotel is undergoing a major renovation, but this only affected the entrance. The rooms are big and comfortable. The location was fantastic, right in the heart of West End, with theatres all around us (we saw The Lion King). Easy walking distance to Buckingham Palace.